Last major update issued on October 25, 2005 at 04:15 UTC. The geomagnetic field was inactive to quiet on October 24. Solar wind speed ranged between 304 and 359 (all day average 332) km/sec. A stream from CH193 or CH194 arrived late in the day and has caused active conditions early on October 25. Solar flux measured at 20h UTC on 2.8 GHz was 73.4. The planetary A index was 4 (STAR Ap - based on the mean of three hour interval ap indices: 4.5). Three hour interval K indices: 10002222 (planetary), 00011222 (Boulder). 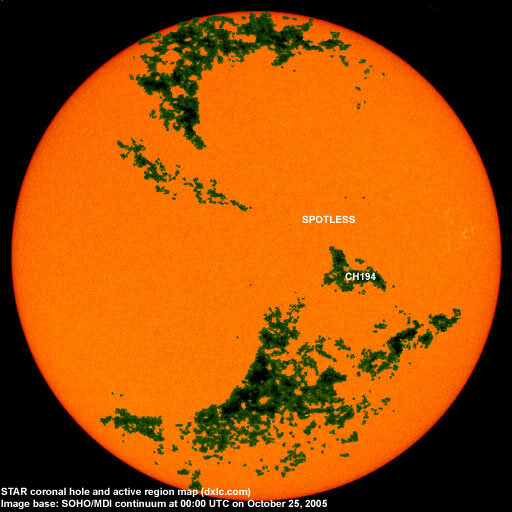 October 22-24: No obvious fully or partly Earth directed CMEs were observed. A full halo CME with an origin on the back side of the sun was observed beginning at 10:24 UTC on October 22. 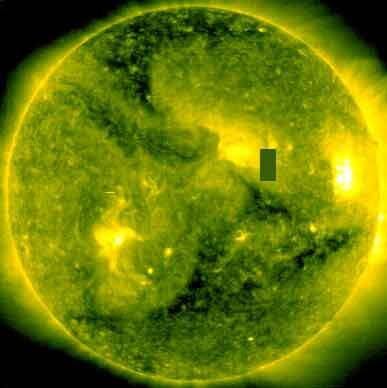 Recurrent trans equatorial coronal hole CH194 was in an Earth facing position on October 22-23. 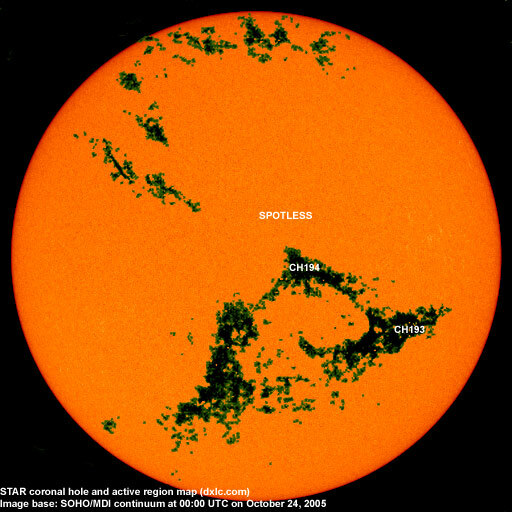 The geomagnetic field is expected to be quiet to active on October 25-26 due to coronal hole effects and quiet to unsettled on October 27. Long distance low and medium frequency (below 2 MHz) propagation along east-west paths over high and upper middle latitudes is was very good early in the night and has deteriorated to fair as I write this. Propagation on long distance northeast-southwest paths is poor. Trans Atlantic propagation conditions are normally monitored every night on 1470 kHz. Dominant stations tonight: WWNN Boca Raton FL, WLAM Lewiston ME and Radio Vibración (Venezuela). Lots of stations from the easternmost US and Canada were heard early in the night, many stations disappeared or faded when the current disturbance intensified.